When it comes to making organisations work well, we tend to think of tangible things like strategies, plans, processes and controls. But while these all have their place, there is something else that we should also consider. Something that is so powerful that if we don’t get it right, then everything else is an irrelevance. I’m talking about culture. The unspoken and unwritten code that exists in every organisation. The way we do things around here. Whether it’s cost-consciousness, efficiency or being nice to your customers, missives from the chief executive, away-days and checklists will get you so far. But it’s only once things get ingrained into your corporate culture that you can rely on them happening as a matter of course. The difficulty, though, is that culture is a difficult thing to measure. And as a result, we tend to ignore it or to assume that it’s something we’ll just have to work around. What we need to do, though, is to understand our organisational cultures and to think about how we can (a) reinforce and celebrate the good bits, (b) change the less helpful bits and (c) use the culture as a force for change. My favourite way of looking at corporate cultures is the ‘Cultural Web’ proposed by Gerry Johnson and Kevan Scholes back in 1992. 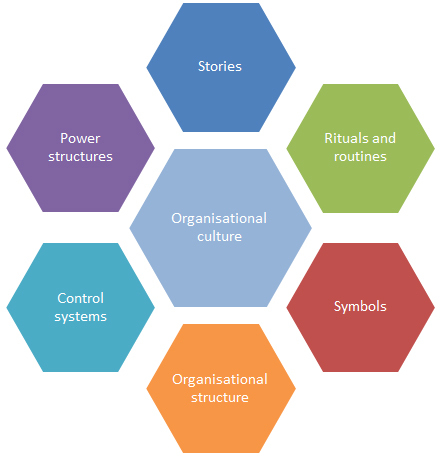 They break an organisation’s culture down into six elements, some of which you’d probably come up with yourself and some that you might not. Let’s look at the different elements in turn. 1. Stories – These are the things that people inside and outside the company talk about. The ‘you remember the time when…?’ yarns that come out at the water cooler. Like when a whole department worked through the night to get an order to a valued customer. Or when the guy in the post room had a great idea that sparked a whole new product line. Stories can be about the little things, too. Like the Chief Executive always travelling standard class on the train or members of the Board spending a day a month working alongside operational staff. 2. Rituals and Routines – These are the day-to-day actions of people across the organisation. They show what sort of behaviour is acceptable and set an expectation of what will happen in different situations. If meetings are frequently allowed to overrun, for example, then nobody will ever bust a gut to finish on time. But if people know that members of the senior management team will leave at the designated finish time, you can guarantee that the important stuff will always make it to the top of the agenda. 3. Symbols – These are the visual representations of the organisation. They include logos and branding, but encompass less obvious things, too, such as the dress code, the state of the offices and the cars that people drive. One of my publicly-funded clients, for example, takes great care to ensure that off-site meetings are always held in low-cost venues, because they don’t like what spending hundreds of pounds on a plush conference centre would say about how they value taxpayers’ money. 4. Organisational Structure – This includes not just the official structure of the organisation as seen on the chart, but also how different parts of the organisation work together. Is everyone in their separate silos or do they come together to collaborate on specific projects? Do they focus on their own priorities or on those of the organisation as a whole? And does everyone communicate up to the top or do they share information between departments, too? 5. Control Systems – These are the ways in which the organisation is controlled. Often seen as the exclusive purview of auditors, they include things like financial systems, quality standards and risk assessments. It also includes the way that your organisation measures and rewards performance. If you want to improve your customer focus, for example, then measure and reward customer satisfaction. Don’t just judge people on how many calls they can answer in an hour. 6. Power Structures – These are where power really lies within the organisation. The little pockets of influence that show who’s really in charge. It might be one or two people, a small group of individuals or a whole department. Does the finance department call the shots, for example, or do operational departments have the final say? Who do you need to talk to if you want to get things done? Whatever the answer, it’s probably not the same as what it says on the organisational chart. The key thing to remember about the cultural web is that it’s just that: a web. Each of the elements is connected to all of the others. What you do in one area will have an impact on everything else. That’s why organisational cultures are such difficult things even to understand, let alone to change. But if harnessed effectively, the ‘way we do things around here’ can make the world of difference to any organisation. This entry was posted in Performance Improvement, Performance Management, Strategy, Thoughts and tagged Cultural Web, Johnson & Scholes, Organisational Culture, People, Performance Improvement, Strategy, Thoughts by Simon Perks. Bookmark the permalink.